Handwheels We have a huge selection of handwheels which are suitable for applications such as packaging machinery, conveyors and food processing equipment. Control Handwheels Our control handwheels are available in a variety of styles and are suited to applications such as heavy duty machinery and sliding storage systems. Handles Our range of handles include revolving handles, T handles, gear handles and ring handles all of which are available in a wide range of sizes. Crank Handles Our crank handles are available in a variety of different styles and are ideal to use on machinery with rotating parts. Bridge Handles We have a wide range of bridge handles which are perfect for use on catering equipment, special purpose machinery and office furniture. Levers We have an extensive range of levers which are ideal for woodworking machinery, medical equipment and catering equipment. Lid, Push, Pull & Ball Knobs Our lid, push, pull and ball knobs are available in a wide range of materials and are suited to special purpose machinery and catering equipment. Wing & Thumb Knobs We have a huge selection of wing and thumb knobs which are ideal for use on leisure equipment, medical equipment and HVAC products. Control Knobs Our control knobs are available in a choice of materials and are widely used on gas appliances and catering equipment. Tube Inserts We have an extensive range of tube inserts which are ideal for use on office furniture and medical equipment. Threaded Tube Inserts Our threaded tube inserts come in all shapes and sizes and are commonly used on office furniture and equipment. Ferrules, End Tips, High Temp Caps & Plugs We have a wide range of ferrules, end tips, high temp caps and plugs all of which offer great protection for tubular products. Plastic & Rubber Feet Our range of plastic and rubber feet are ideal for point of sale products and contract furniture. Various sizes, shapes and styles available. Tube Connectors We have an extensive range of tube connectors which are ideal for retail display products and educational furniture. Adjustable Feet Our range of adjustable feet are ideal for office furniture, point of sale products and catering equipment. Castors Our castors are available in a wide range of materials and can be used on medical equipment, retail stands and catering trolleys. Wheels & Fittings Our wheels are available in a choice of materials and are suitable for a variety of different applications. Anti Vibration Dampers We have an extensive range of anti-vibration dampers which are commonly used on engines, compressors and pumps. Hinges We have a wide range of hinges which are perfect for use on metal cabinets and enclosures. Locks & Latches Our locks and latches offer great choice and value for money. Ideal for sever cabinets and electrical enclosures. Drawer Slides Our drawer slides come in sizes ranging from 250mm to 700mm. Perfect for filing cabinets and other office furniture. Plungers We have an extensive range of plungers which are commonly used on gym equipment, medical furniture and lifting gear. Plastic Fixings & Fasteners We have a wide range of fixings and fasteners. Metal Fixings & Fasteners We have a wide range of fixings and fasteners which are available in nylon, steel and stainless steel. Spacers All of our spacers are manufactured in nylon 6.6 and are suitable for a variety of industrial applications. Bushes & Insulation Sleeves We have a huge range of bushes and insulation sleeves all of which are moulded in nylon 6.6. Grips, Sleeves & Caps Our grips, sleeves and caps are perfect to use on sports equipment, gas valves and display products. Cable Management We have a huge range of cable management products to suit a variety of different applications. Bolt/Nut Caps & Plastic Fittings Our extensive range of bolt caps and plastic fittings are prefect for shop fitting and furniture applications. Fire Safety & First Aid Signs Our fire safety and first aid signs are available in a choice of materials and sizes. Prohibition Signs & Hazard Signs We have a wide range of prohibition and hazard signs available for immediate despatch. Mandatory Signs Our mandatory signs inform people of what they must do to comply with safety procedures. Sign Fixings Our sign fixings are both quick and easy to apply. 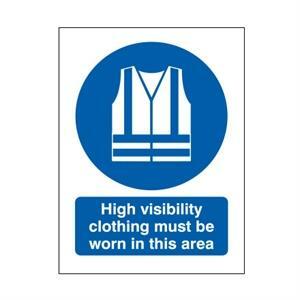 High visibility clothing must be worn in this area. Manufactured in 1.2mm rigid polypropylene or self-adhesive vinyl. 600mm x 450mm. Your basket is empty. Cotel Mouldings operate a minimum goods order value of £25. You're order has reached the minimum order value! You can now checkout if you wish.